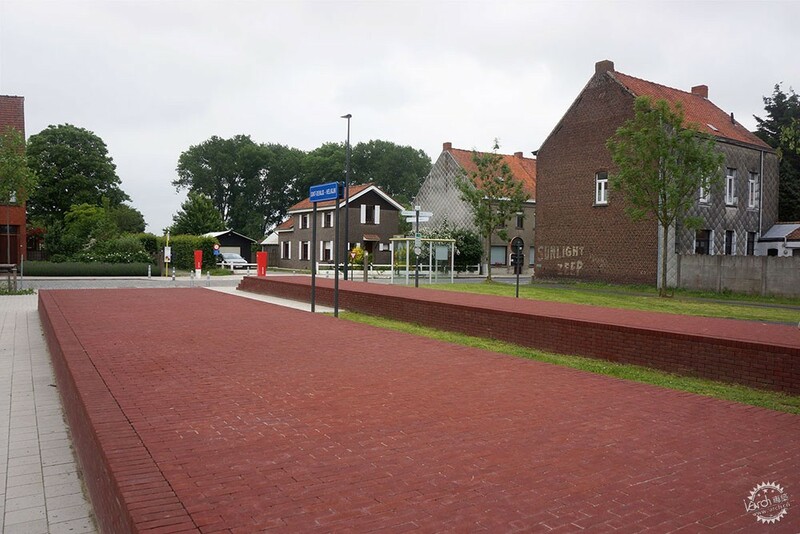 100Landschaftsarchitektur: The Oud Stationsplein is part of the former regional train line 85, now called ‘Trimaarzate’. Train traffic in Sint Denijs was abandoned by 1960. 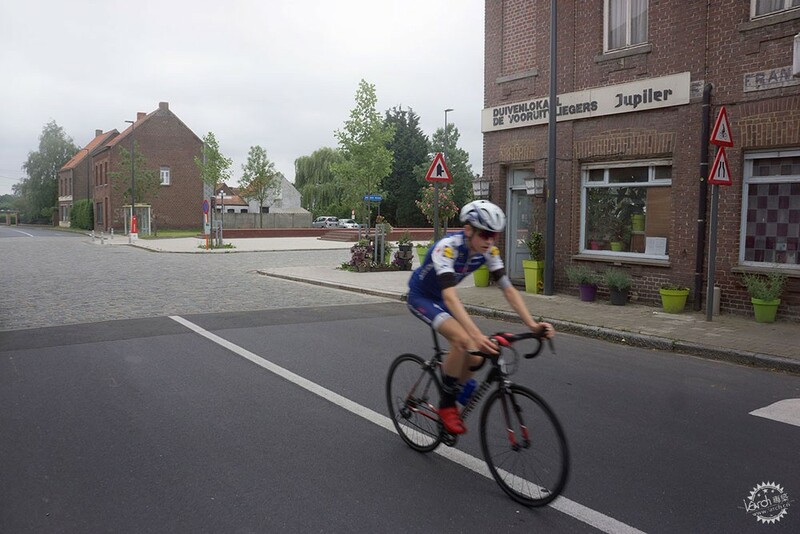 Recently a bicycle path was laid out along the former track, connecting the old station square with a dense network of different recreational paths. These new paths make use of the given spatial situation in the landscape and of the openings and layouts in the built-up areas. The linear remnants of the train tracks that are reused in the new transport and leisure network are quite obviously linked to the historic background. In other, urbanistically more complex areas – such as the area of the station square – the former context is not as obvious any more. As a consequence there are ‚strange‘ places that seem to have no story to them. 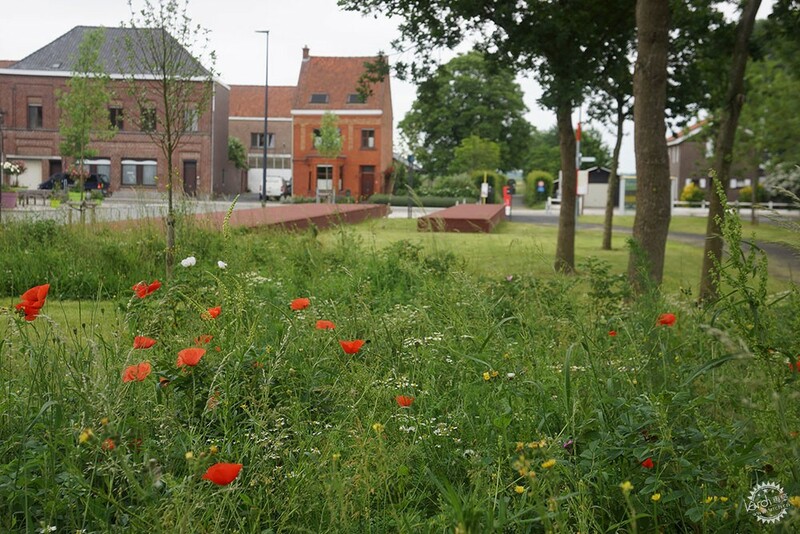 The Lelijke Plekjes/Ugly Spots initiative gives the opportunity to clarify and communicate a context, adding a narrative vein to the great achievement of newly reconnecting the landscapes of Leiedal and Westflanders. 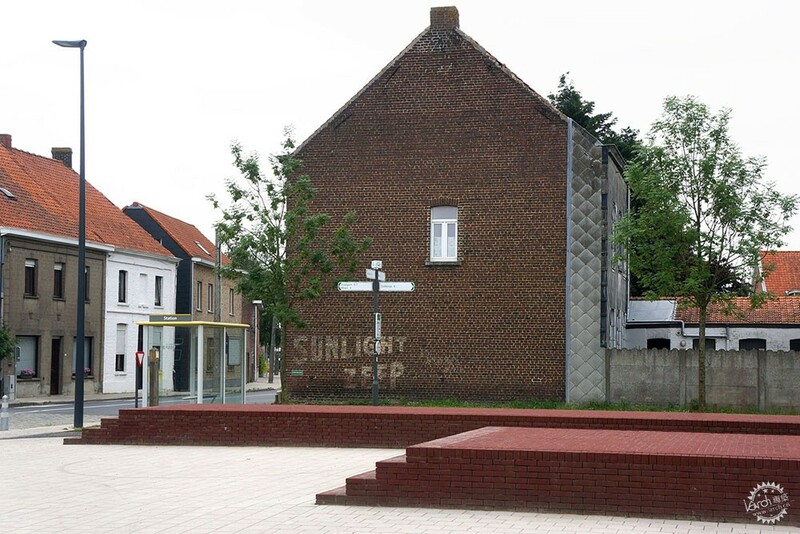 The old station square in Sint Denijs had been lying unused for many decades. The station building was long ago razed and except for a small bus stop and the now run-down hotel, little remained that references the central traffic switch position that the place used to have before public activity moved towards the historic centre of the small town. Still, the place is a crossroads, where now cyclists and wanderers pass through. – reintroducing a narrative element that makes the background and history of the site legible. The most important spatial gesture is opening the visual relationship across the whole width of the place. For this the existing trees on the dam are thinned out. 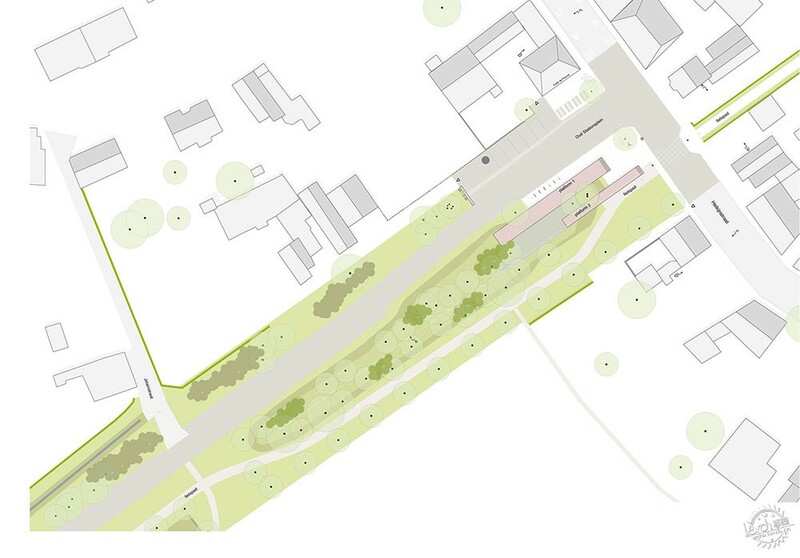 The aim is to generate a transformative gesture that spans from the openness of single trees on the square at Helkijnstraat, via a loose tree canopy with no undergrowth in the central part to a denser vegetative volume that “leads” into the open landscape. The square will have a new presence. Everyone crossing and bypassing will now notice passing over or by a square. The opening of the square is reinforced by placing the bus stand on the side of the square and generally clearing extra objects and traffic signs out of the centre of the space. Two large tulip trees are planted in the square. 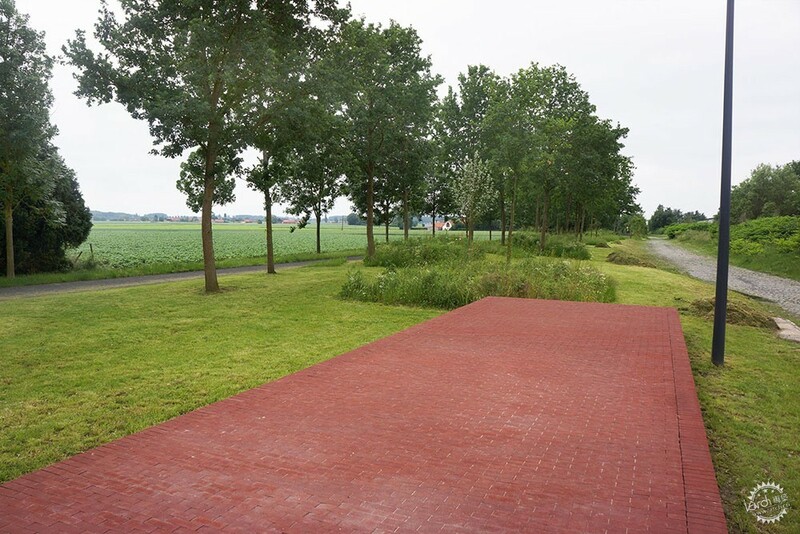 As a pair they will form a “gate” onto the square, and a gate from Helkijn Straat into the open landscape of the fields. 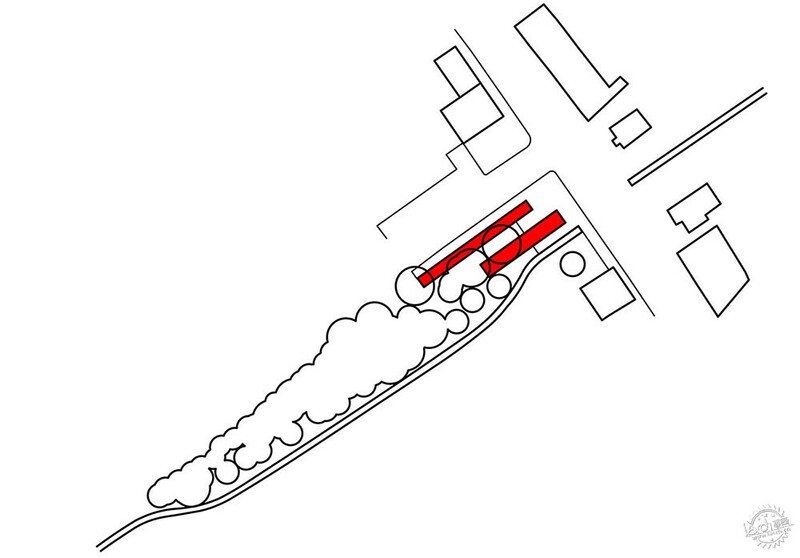 The central, almost sculptural gesture to give the redesign of old Station Square catalysing moment for its possible reactivation, is a pair of “platforms” of different width and length. 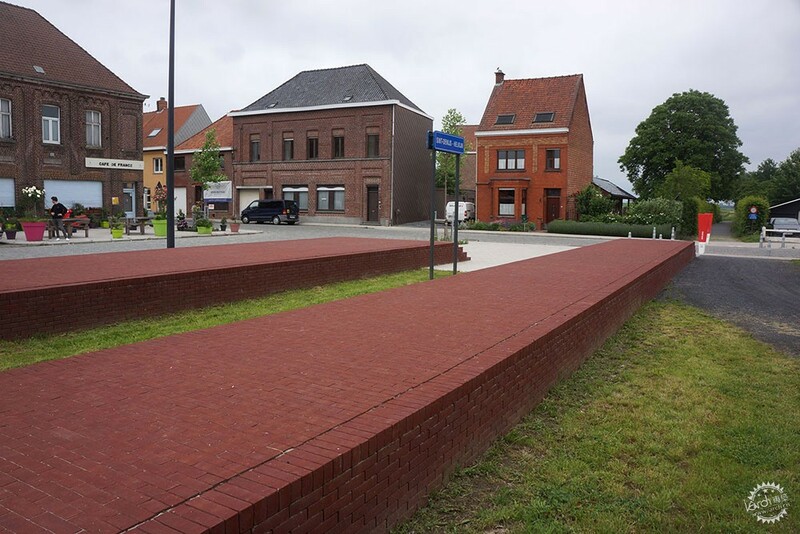 These volumes are fully clad in bricks, like the adjacent houses, and in this way create an abstract reminder of the train station and platforms in one gesture. 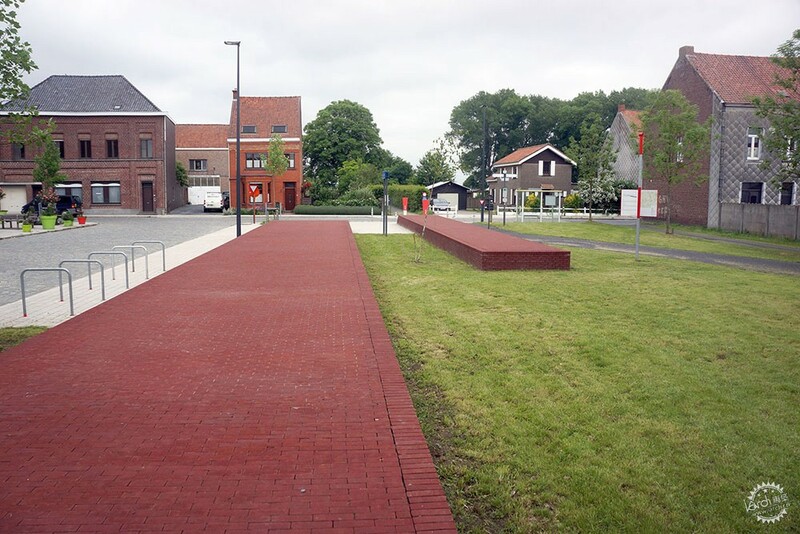 Set on the square and extending into the adjacent dam, the two re-enacted „platforms“ enhance the context with a narrative of the former train station. 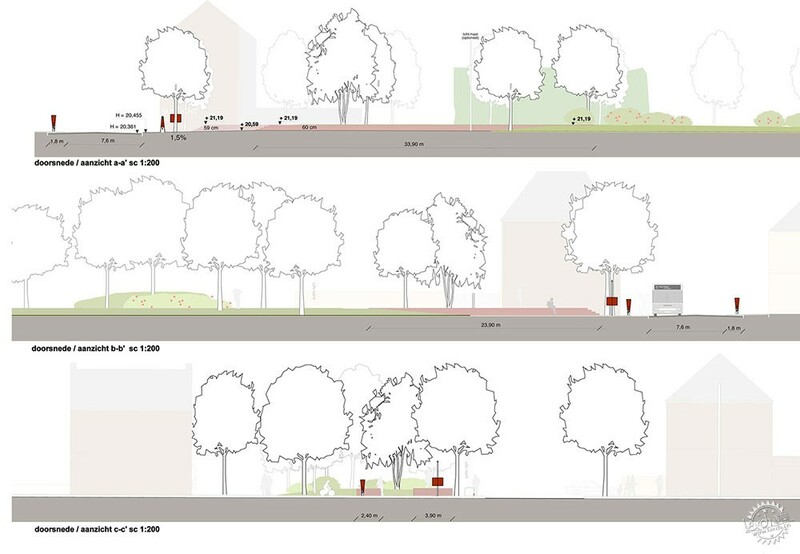 The forms create a transitional, directional gesture between the more urban square next to Helkijnstraat and the departure of the tree covered dam into the open landscape. 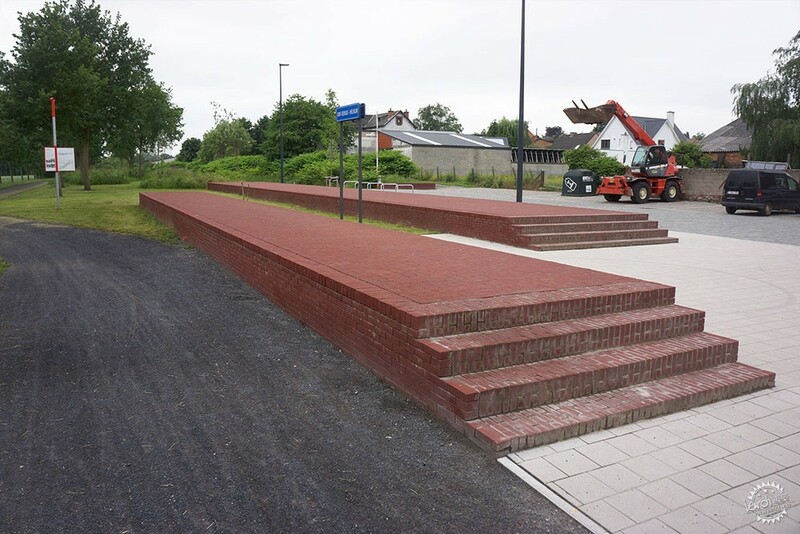 The platforms can become socially functional elements in the public space. Set at a height of 55 cm they can be used as seat and/or a stage. The space between them has invites to meet and come together. 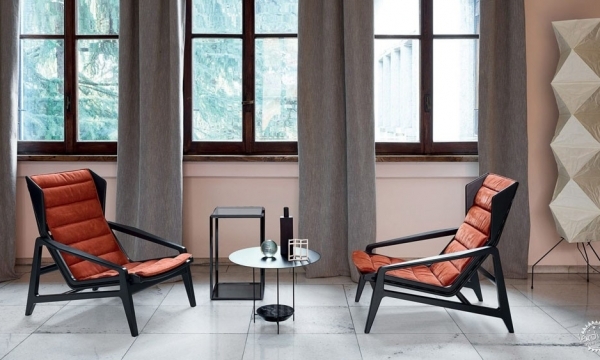 No further site furniture is necessary on the square. More seating is offered under the tree canopy in the grove on the dam. In this zone between square and open landscape flowering shrubs such as wild roses could make for a shady park-like place. 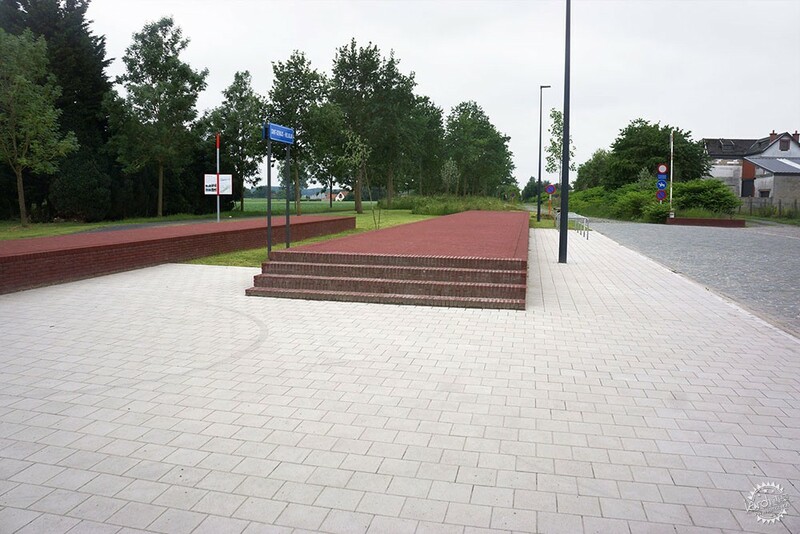 Here a few benches offer relaxed seating for a rest on a bicycle tour, for reading a book, or a friendly chat. 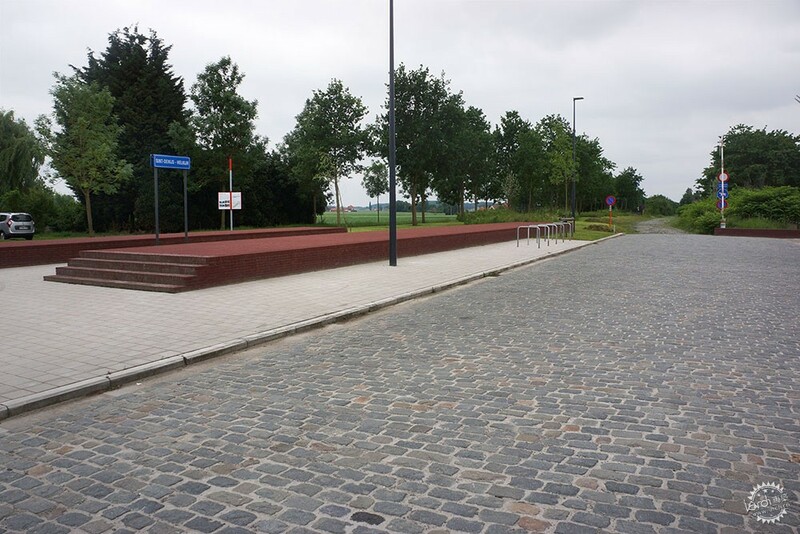 A slight reorganisation of the squares’ surfaces will help to generate the functional opportunities of public users. Motorised traffic should not be excluded from the square are altogether–after all a station square is essentially about the convergence of different modes of transportation. At the same time, pedestrian traffic and areas for relaxation, for meeting, or even for staging small cultural events do currently not exist there. 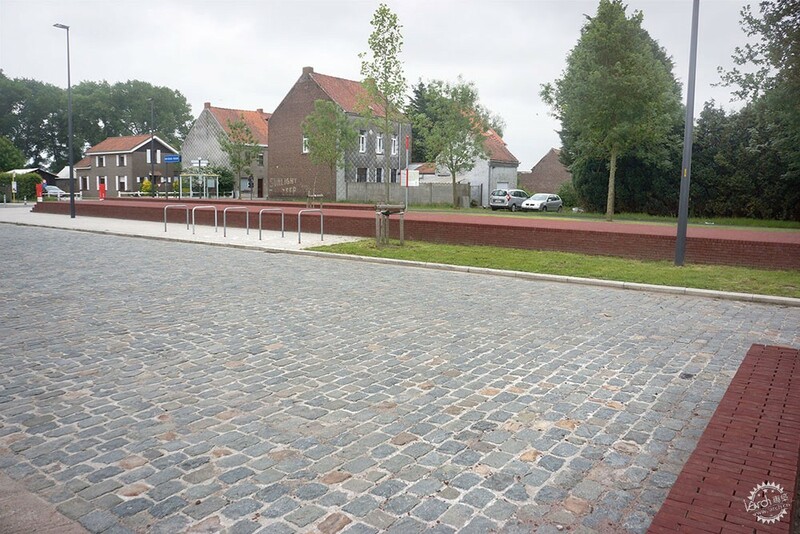 The sidewalk at Helkijnstraat is extended to create a paved surface in the middle of the square. The same is done next to the Café de Paris. 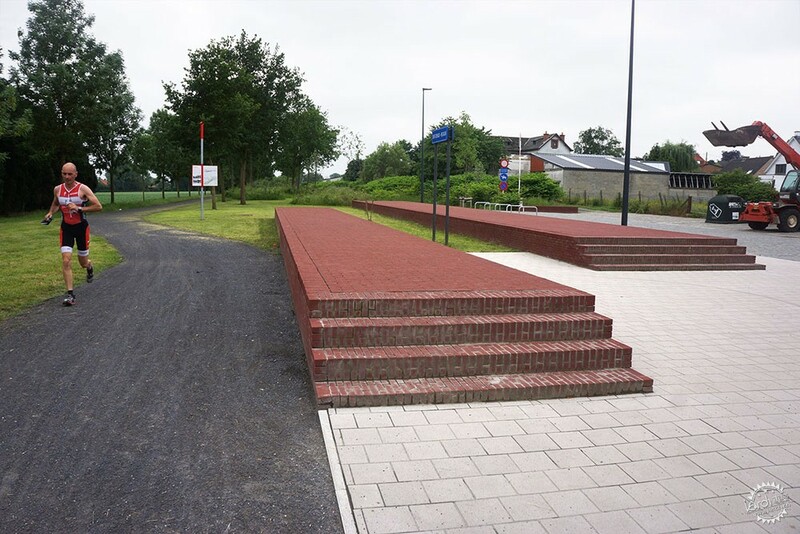 This creates two distinct surfaces that offer themselves to pedestrians. The Oud Stationsplein has a (central) square again and a terrace in front of the café. The café will have a chance to use the exterior space for outdoor seating.